Allow us to be the first to say goodbye to 2016. 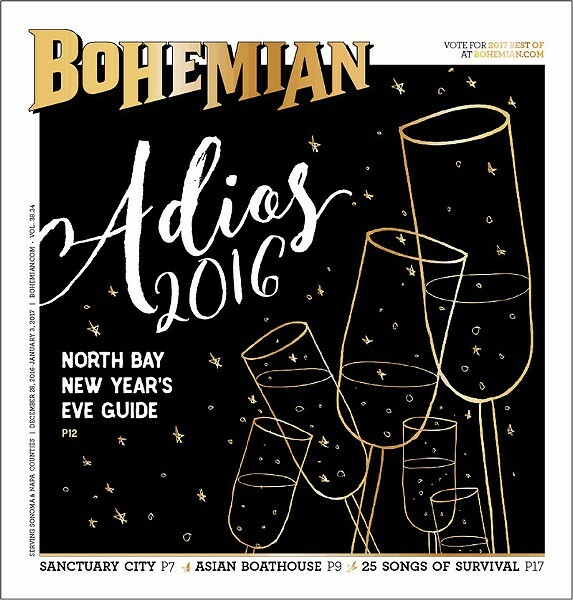 With old acquaintances—both forgotten and remembered—we'll take a cup o' kindness yet, and we'll start with these New Year's Eve parties around the North Bay. From delectable dinners to cabaret shows and blowout concerts, here's a selection of ways to ring in 2017. Kids love New Year's Eve as much as the rest of us, but staying up late is not their strong suit. Instead, take them to the Charles M. Schulz Museum for a fun afternoon of crafts and games, with a big balloon drop and root beer toasts at noon and 3pm. Hey, it's New Year's somewhere. 2301 Hardies Lane, Santa Rosa. 10am to 4pm. $5–$12. 707.579.4452. The North Bay Cabaret never fails to surprise in its eclectic monthly variety shows, and master of ceremonies Jake Ward is pulling out all the stops for this New Year's Eve spectacular. Attendees to the masquerade are encouraged to dress the part, eye masks included, and the night's elegance will be matched by the entertainment. Burlesque, belly dance and circus and sideshow acts all come together for a night of dazzling feats, with DJs spinning until 2am and Champagne at midnight. There's even a raffle with proceeds benefiting Syrian refugees through local nonprofit the Schoolbox Project, which provides education and support to refugee children and families. Whiskey Tip, 1910 Sebastopol Road, Santa Rosa. 8pm. $20–$25 (21 and over). mischiefmasqueradenye.brownpapertickets.com. The Luther Burbank Center for the Arts is getting into the New Year's Eve game this year, debuting its own showcase of local music, wine, beer and more in the first annual Bubble Ball. Dance the night away with popular local bands like Wonderbread 5, Kingsborough and the Pat Jordan Band, while sipping (or chugging) the best local brews and vino, and tasting local culinary masters. A general admission ticket gets you a little bit of everything, including the Champagne toast. The night also benefits Greenacre Homes in its quest to serve Sonoma County youth with special needs. 50 Mark West Springs Road, Santa Rosa. 8pm. $95 (21 and over). 707.546.3600. Each summer, the popular Rivertown Revival turns downtown Petaluma into a wonderland of DIY arts and local music. This year, the folks behind the revival, including the North Bay Hootenanny and Second Octave Entertainment, turn their eyes to New Year's Eve and premiere the Rivertown Ball. Tobias "the Mystic Man" Weinberger of the vaudeville-on-wheels Traveling Spectacular hosts, San Francisco soul-powered band Monophonics headline, and Marin's El Radio Fantastique and Sonoma County's ragtag Oddjob Ensemble fill out the lineup. All the while, aerialists and sword swallowers roam, and libations from Lagunitas and Sonoma Cider fuel the fun. The Rivertown Ball also benefits Friends of the Petaluma River, and proceeds will help keep the watershed vibrant. Petaluma Veterans Memorial Hall, 1094 Petaluma Blvd. S., Petaluma. 8pm. $70; $55 for designated drivers (21 and over). rivertownrevival.com. The Healdsburg culinary destination has a motto: Eat the View. For New Year's Eve, the view is looking particularly delicious, as Barndiva's restaurant and bistro offer two separate menus of elegant dining in a festive and fun atmosphere. In the restaurant, a six-course meal of classic favorites features scallops and short ribs with special wine pairings available. In the relaxed bistro setting, the music gets pumping as you choose between beef fillets and roasted sole before working off the calories with a dance or two. Reservations are recommended. 231 Center St., Healdsburg. 707.431.0100. Whether you want an amazing dinner to start the night's fun, or a spot for late-night cocktails to wrap up your New Year's Eve, Spoonbar has what you're looking for. First up, a decadent four-course meal boasts luxurious caviar, truffle ravioli, seared black bass and roasted lamb loins on the menu. After the meal, DJs get the dance party going while photo booths and other fun activities keep spirits high. If you show up after 10pm, you can still partake in the dessert bar and sip on handcrafted cocktails before a glittering Champagne toast rings in the new year. Spoonbar, 219 Healdsburg Ave., Healdsburg. 6pm, dinner; 10pm, party. $125 dinner; $55 party. 707.433.7222. Sky Hill Cultural Alliance and the Petaluma Museum Association present their eighth annual gala concert and dance with classical flair and marvelous entertainment. First up, the historical museum and library hosts members of the San Francisco Symphony in concert. Violinist Yun Chu, cellist Shu-Yi Pai and viola player Nancy Severance have been performing in the gala since the series' inception, and this year they are joined by North Bay mezzo-soprano Karen Clark for a program of awe-inspiring artistry and music. After the show, it's time to dance the night away, as the action moves to nearby Hermann Sons' Hall for "A Night in Vienna," featuring many traditional Austrian dishes and desserts, and waltzes performed by a live orchestra. This black-tie-optional event toasts New Year's in stellar fashion. Gala concert happens at 20 Fourth St., Petaluma, 6pm. $50–$70. "A Night in Vienna" happens at 860 Western Ave., Petaluma. 8:30pm. $150. 707.778.4398. After a year of vitriol and anger on all sides of the spectrum, Sebastopol wants to ring in the new year with an emphasis on peace. The party at the Sebastopol Community Center will offer lots of live music and drink, but there will also be thoughtful moments during the celebration to reinforce the feeling of love and togetherness that the west Sonoma County town has come to embody. Onstage, R&B funk masters Soul Fuse and laidback rockers the Rhythm Rangers, winners of the 2016 NorBay Music Award for best Americana and Country band, co-headline the night. Other local favorites like Levi Lloyd, Buzzy Martin, Sarah Baker and Mr. Music and the Love Choir also contribute to the positive vibes. Amid the dancing, a full bar will warm the belly and a peace ceremony led by shaman and author Francis Rico will warm the heart. 390 Morris St., Sebastopol. Doors at 7:30pm. $18–$25. 707.823.1511.